Wonder Woman Finds Dead Body. In today’s episode, Wonder Woman finds a dead body in the Potomac River in Washington D.C. while on a nice relaxing canoe ride. No wait, that really happened. 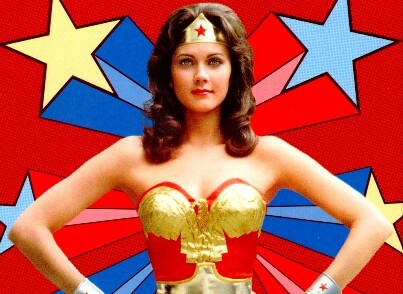 Lynda Carter, who played Wonder Woman in the 70’s television show, came upon a female body floating face down in the river and promptly alerted nearby boaters, as she did not have a cell phone with her. “A middle-aged woman was found floating in the water about a quarter mile north of Three Sisters Island. She was found by a woman in a canoe who flagged down some boats and they called Fire and EMS,” stated Scott Kane, the spokesperson for Washington D.C. Fire and Emergency Services. Police are speculating that the woman was on a hike when she slipped and fell into the river below. Personally, I don’t know if I would have been as calm as Lynda Carter if I came upon a dead body. I’ve seen a body covered with a yellow sheet in the middle of the road after a fatal motorcycle accident, but that’s it. *Lynda herself came up with the idea of spinning to have Wonder Woman change into her costume. *Lynda owns the DVD release rights to all of her TV specials. *In late 2005, Lynda Carter took the role of Matron Mama Morton in the West End production of Chicago. previous post: Rev Run And Justine Are Good People. next post: Jessica Alba & Tori Spelling Give Birth. 50 queries in 0.609 seconds.